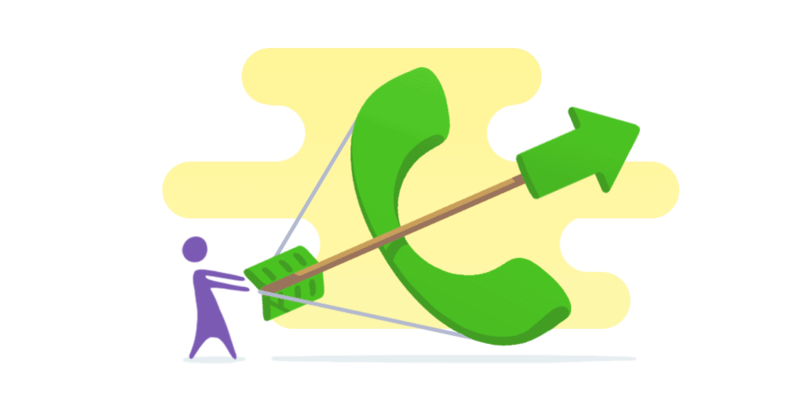 There are many factors which will determine the success or failure of an outbound call effort. Most of these factors can be tipped in your favor with the right planning and preparedness. Approaching an outbound campaign requires a sound outbound calls strategy. Your outbound call strategy needs to be defined long before anyone picks up the phone. Of course, it will be reworked and modified along the way, but it needs dedicated planning from the get-go. In order to set a course, you need to have a clear idea of the end goal of your campaign. Is your objective to set appointments? Straight sales? Surveying? Who are you hoping to contact? These questions (and their answers) will help you draw up call lists as well as establish KPIs. KPIs, or Key Performance Indicators, will be the foundation upon which you will be able to appraise the success of your outbound calls strategy. Not all KPIs are created equal and not all of them are relevant to outbound sales. Thankfully, measuring every KPI, all the time, would be a tremendous waste of time and resources and would yield an unmanageable and opaque amount of data. Here is a small selection of KPIs which you might deem worthwhile. The average amount of time an agent spends on calls, including hold or transfer time. A long average call time might be a sign of poor closing skills or insufficient product understanding. Conversion rate is a measure of how efficiently agents are able to bring on customers and close a sale. A high percentage of first call closes shows that agents are selling efficiently, and making the most of their time (and the customers’). A low occupancy rate percentage reveals that agents might have trouble completing their after-call work, and losing on overall productivity. Blind cold calling is a game of numbers, but not very good ones. If your call lists are made up of qualified leads, then your agents are more likely to succeed. Qualified leads have been nurtured thanks to marketing efforts, the fat has been trimmed, and what’s left are prospects with potential. Doing research on product needs, location, industry, internal organization, etc., gives your agents a leg up when it comes to making a connection and guiding a prospect to a sale. Nothing screams “blind cold call” louder than asking to speak to “the proprietor,” whereas knowing your interlocutor’s name can go a long way. Using the proper tools can be a tremendous boon as well. A CRM solution can help keep track of leads and rank them by promise in order to assist the whittling process. Managers can assign tasks, and the whole calling team can stay on the same page. Integrating your phone system into your CRM is taking it one step further. You’ll be able to call prospects with a single click, and centralize all important call information. To use scripts or not to use scripts? We’ve looked at the advantages of call center scripts. They can help agents retain information, avoid mistakes, and remain consistent across calls. However, customers can smell stilted call center scripts from a mile away. If you opt to write scripts for your outbound calls strategy, the trick to craft them to help agents without tying their hands. A good script will give your agents something on which to lean if they’re struggling without making their speech sound contrived and unnatural. One way to provide this kind of script is to give agents input, to let their voice and concerns be represented. Implement A/B testing to refine the raw material and find the most effective wording to convince and engage prospects. Anticipate common objections and queries in order to forestall them. If you make script creation a collaborative and flexible process, the resulting scripts will be an integral and useful part of the training process, convenient for agents, and welcome for customers. In order to plan an effective outbound campaign, you need to have a sound team of motivated agents. Careful hiring is the first step in that direction. There are certain skills which make a good agent, but those skills must be refined by training, and motivated by incentives. Incentives should be both short- and long-term, in order to encourage continued excellence. This encompasses everything from daily competitions with small prizes, to commissions based on monthly or quarterly performance. The important thing is to motivate through metrics, not fear. The KPIs upon which you decided early in the strategizing process should be the basis for payoff, since the promise of a reward is a far healthier motivator than the threat of retribution. The defining moment of your outbound calls strategy is, unsurprisingly, the actual first phone call. Bedside manner is crucial, even with a sound foundation of a qualified prospect list and a clever script. There are so many resources on the most efficient ways to ace cold calls, warm calls, survey calls, and every other type of call known to man. In a nutshell, here is a short checklist to ensure that a given outbound calls is a success. The very start of a call is of paramount importance. If an agent doesn’t pique the prospect’s interest, the latter won’t lose much if they simply hang up. Call the prospect by their name, show them that you’re interested in them, their situation, and the betterment thereof. Don’t sound cookie-cutter, and don’t make the mistake of centering the conversation around yourself. Immediately make the prospect feel that you’re calling them for a reason. Mention something you know abut their business which pertains to your end goal. This is why it’s worthwhile to do your homework, and only work with qualified leads about which you already have a measure of intel. Time is the most valuable currency. Show the prospect that you value their time (and yours) as much as they do. Ask them how much time they have before launching into your pitch, and be direct. The initial call is successful if you manage to whip up the prospect’s enthusiasm. However, especially if the call is going well, resist the temptation to rush in a blaze of glory. If you make a commitment to a prospect before you know the ins and outs of their situation (which is nigh-impossible without running long on your first call), and can’t follow it up with actions, that prospect’s trust will be gone forever. That’s what a follow-up meeting is for. Once you have the prospect’s interest, quickly set a time for a subsequent beating while the iron is still hot. This way, you’ll end the call on a high note and will be able to prepare the follow-up call properly. You’ll come off as more knowledgeable and professional, which is sure to bode well for a prospective client. By the time it ends, every call, both successful and failed, should serve to reinforce your outbound calls strategy. Learn what to replicate from the former, and what the avoid from the latter. There are two facets to a successful monitoring effort for your outbound call strategy: call quality monitoring and regular agent coaching. The first lets manager gauge the efficiency of their team based on agents’ real performance. The second puts into practice the insight gained from monitoring, put in perspective with the relevant KPIs. Recognize common mistakes, and how they are reflected in your KPIs. For instance, an agent with high prospect engagement but an elevated cancellation rate might be making promises they can’t keep to prospects who churn before going all the way through the sales funnel. Regular coaching sessions will ensure that your outbound call strategy keeps being perfected by involving agents in personalized training booster shots. It’s important that coaching be one-on-one, based on data, and helpful rather than punitive. Give agents the opportunity to weigh in and give feedback on their training. Measuring agent satisfaction, command of the product, and confidence is as important as tracking their performance; empowered, well-informed, and motivated agents are your best asset to pull off a successful outbound campaign. Did you know that Aircall’s virtual phone system is perfect for outbound sales teams?